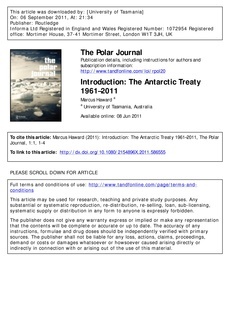 June 23, 2011 marks the fiftieth anniversary of the entry into force of the Antarctic Treaty. Much has been written about this treaty and its negotiation, with the anniversary of its signing recognized in a variety of ways.1 The Antarctic Treaty is a remarkable instrument. The treaty, established in the Cold War, and building on unprecedented collaboration between states in the International Geophysical Year (IGY) of 1957–58, is noteworthy in a number of aspects. The treaty addressed the major elements of the Antarctic Problem: differing attitudes to territorial claims and the potential conflict over the overlapping claims of Chile, Argentina and the United Kingdom in the Antarctic Peninsula. The Antarctic Treaty set aside this problem through the provisions of Article IV. In addition, the treaty demilitarized the Antarctic continent (and surrounding ocean) and established a nuclear-free zone. These provisions were supplemented by the development of an innovative inspection regime. The Antarctic Treaty is a security instrument and, with its focus on science, provides one of the earliest examples of what is now termed environmental security. The treaty built on the "gentleman’s agreement" that continued the "standstill proposal" relating to territorial acquisition during the IGY. Together with commitments to scientific endeavour developing from the work of the IGY, and more recently reinforced through the third International Polar Year of 2007–08, the core values of peace and science have retained their centrality.